President Calvin Coolidge and Attorney General John Garibaldi Sargent standing on the lawn of the White House, March 18, 1925. 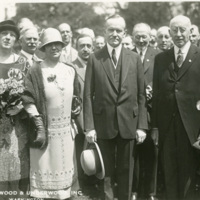 Calvin Coolidge holding hat and flowers, smiling at camera while leaving the White House, March 25, 1926. President Coolidge opens the International Trade Exhibition in New Orleans on February 1, 1926 by pressing a telegraph key in an office at the White House. Senators Ransdell and Broussard and members of the Louisiana Congressional delegation observe. President Calvin Coolidge stands in front of the White House with a large group of engineers hailing from sixteen different countries, April 24, 1926.